New York City at Christmastime has a bit of magic that you don't find in many other American cities. It may be the ice skating at Rockefeller Center, the fancy window displays or the nostalgia from many holiday movies set in the city: Home Alone II, Elf, and Miracle on 34th Street to name a few. 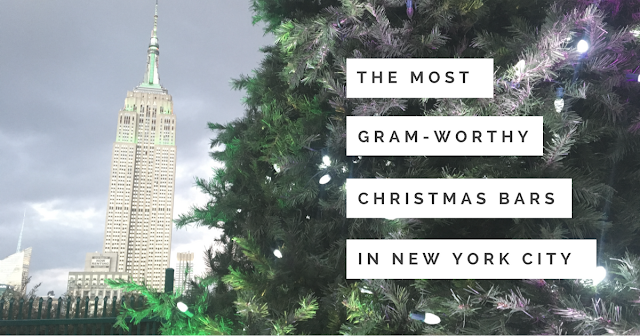 I recently spent a weekend in The Big Apple to soak in all the holiday charm it has to offer. And for me, nothing brings out the warm and fuzzies more than a stiff eggnog at a cozy bar. I was visiting the same time as SantaCon, but my friends and I stayed far away from that crowd and created our own personal Christmas bar crawl. Here are some of the most festive Christmas bars in New York City. I'm already excited to head back next December to continue perfecting this Christmas Crawl! Rolf's is probably THE Christmas bar of New York City. The restaurant spends around $60,000 on decorations and maintains the decor until May. They also offer themed drinks like holiday martinis and spiced eggnog. There's usually a line at the door about 40 people deep during the holidays, but luckily you have many months to catch this decorative display. Pete's Tavern takes a unique approach to holiday décor by covering the entire ceiling with red lights. The wreaths out front and the Santas behind the bar also bring in a little cheer. Not only do Pete's holiday decorations make it a special place, it is also the oldest continuously operating restaurant and bar in New York City... open since 1864! For views of the city skyline without freezing your buns off, 230 Fifth Rooftop is the place to be. Sip your drink inside an inflatable igloo while wearing a complimentary red robe. The igloos will be open on the rooftop until the end of March. The decorations here elicit winter forests and magic kingdoms, but you really come for the drinks! Order a Shakespeare's Globe and sip your cocktail out of an actual snow globe. Visit before this pop-up leave NYLO Hotel on January 1. As if you need any other excuse to get there, $2 from every drink goes to Save the Children. Go ahead, buy the first round! Step into Gallow Green and feel like you skied right up after a long day on the slopes. The lodge sits on top of the McKittrick Hotel and transforms itself into a rustic chalet during the winter months. Cozy up to the fire with a glass of mulled wine or venture outside to a snow-covered pine forest.